Hero MotoCorp has announced plans to launch its hybrid scooter the Hero Leap in European countries such as France, Italy and Spain by the end of 2015. The scooter was first showcased as a concept by Hero at the 2012 Auto Expo with the production version being unveiled at the Hero Universe event held at Delhi earlier this year. Hero had earlier announced plans to sell the hybrid scooter in Europe by 2015 and has now made an official announcement stating that the first countries to get the two wheeler will be France, Italy and Europe. The Hero Leap will be manufactured in the company’s facility in Manesar, Haryana and exported to these countries from India. Production will be restricted to 500 units a month initially and once the brand is established further expansion will take place in the form of U.K. and Germany which would also mean an increase in production. The Hero Leap hybrid scooter utilises a series hybrid drivetrain i.e. the petrol engine present on-board is used to charge the battery pack which in turn power the electric motor and subsequently the wheels. The Hero Leap is the country’s first hybrid scooter and runs on a lithium-ion battery which teams up with a 10.7 BHP electric traction motor. The fuel-combustion powertrain is a 124cc unit which is an all new unit developed by Hero with a fuel tank capacity of 3 litres. The Permanent Magnet Alternating Current (PMAC) motor delivers a whopping 60 Nm of torque right from the word go. It will have a range of around 340-350 kms with a top speed of around a 100 kmph. The scooter gets a LED projector headlamp, a position lamp and a stop lamp. You get a small wind shield too which seems like an after-thought but manages to gel well with the overall package. The Hero Leap is the first indigenous hybrid scooter and will be exported to Europe. 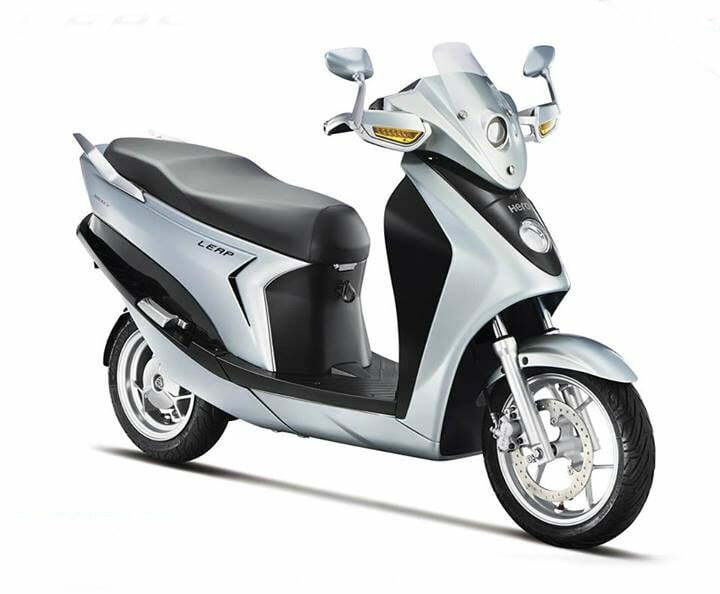 However, it is unclear whether the scooter will be sold in India or not mainly due to the very high projected price of the scooter of around Rs. 90,000 to 1,00,000. Maybe a launch could take place some time later on when the Government’s proposed NEMMP (National Electric Mobility Mission Plan) 2020 comes to fruition.